New College was established in 1379 by Bishop William of Wykeham. The official name of the college is “The Warden and Scholars of St. Mary College of Winchester in Oxford, commonly called New College in Oxford”. Several decades earlier, in 1326, another college in Oxford was named after the Virgin Mary; its official name was “The House of Blessed Mary the Virgin in Oxford, commonly called Oriel College”. The second college named for the Virgin Mary was therefore commonly called “New College”. Along with Christ Church and Magdalen it is one of the largest and grandest colleges in Oxford. As one guide puts it, “it is one of the largest and best known colleges, and undeniably one of the most beautiful”. New College has some of the largest and most beautiful gardens in Oxford; it is also famous for its medieval cloisters. The dining hall is the oldest of any Oxford or Cambridge college. 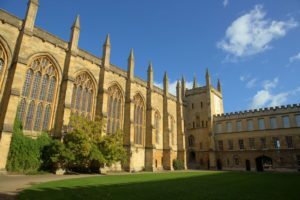 Over the centuries, Britons who became leaders in all walks of life studied at New College. The faculty is particularly distinguished, having five scholars who are either Fellows of the British Academy (for leading scholars in the humanities) or Fellows of the Royal Society (for leading scholars in the sciences). The faculty also includes nine professors (in Oxford there is usually only one Chair – professorial title – in each subject). Last year New College had the largest number of graduates earning first class degrees. The College admits both men and women and there are now over 360 undergraduates and over 125 graduate students. Students say that because of the large size of the college (by Oxford standards) most interests are represented and the student body is both diverse and very friendly. They have always given a warm welcome to American and other overseas students. (OSAP has worked with New College since 1988). The University prospectus notes that “the College offers a full range of sporting facilities.” There is a riverside sports field with a pavilion and squash courts. At New College, the Academic Supervisor for Visiting Students is Mark Griffith (D.Phil, Oxon). He is Fellow and Tutor in English and is Senior Tutor (Academic Dean). OSAP is the only overseas program (open to all qualified students) that recommends students for Visiting Student places at New College. For more information on New College, visit www.new.ox.ac.uk. "I was taught by two Professors [holders of Chairs, usually only one don in the University in each subject], both of whom were Fellows of the British Academy. My academic program could not have been better." "I enjoyed my tutorials immensely and think this system of teaching to be one of the best I have ever encountered. It allowed me to become more interested than I have ever been in my subjects."